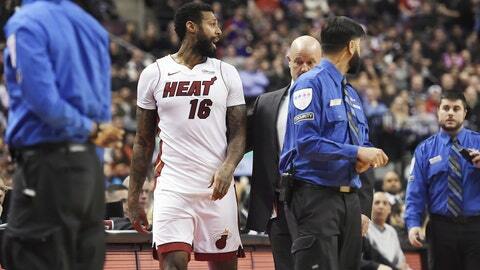 Miami Heat forward James Johnson (16) is ejected from the game along with Toronto Raptors forward Serge Ibaka, not seen, during the second half of Tuesday's game. NEW YORK (AP) — The NBA has suspended Miami Heat forward James Johnson and Toronto Raptors forward Serge Ibaka one game apiece for throwing punches at each other. Johnson is serving his suspension Wednesday night when the Heat visit the Indiana Pacers. Ibaka will serve his suspension Thursday night when the Raptors host the Cleveland Cavaliers. The NBA also fined the Raptors’ DeMar DeRozan $25,000 and the Heat’s Goran Dragic $10,000 for a separate altercation at the end of the game, during which DeRozan attempted to shove.